A firm co-owned by a Northamptonshire county councillor was paid £60,000 of the cash-strapped authority's money, emails have revealed. Conservative Andre Gonzales De Savage's company, Explore Communications, received the payment from council-owned NEA Properties Ltd in May 2012. The documents stated Explore Communications was paid for "tourism promotion and business support". Mr Gonzales De Savage has not responded to the BBC's questions. The payment was revealed in emails obtained by a Freedom of Information request two years later by Labour member Liam Costello. Emails show Mr Gonzales De Savage asked an accountant at the council to expedite the transfer. In one, he asked "can you put the payment together for the £60,000 to Explore (for tourism promotion and business support) and we will then get acknowledgement via the agreement with NEP (Northamptonshire Enterprise Partnership)". Explore Communications had previously undertaken work for NEP, whose chief executive at the time, Rob Purdie, had the remaining shareholding in Explore. Mr Purdie did not respond when approached by the BBC. A handwritten note in the FOI disclosure also records the £60,000 payment was retrospectively approved at an NEA Properties board meeting in September 2012. The note, which lists those present at the meeting, did not include the name of the company's other director, Conservative councillor Bill Parker. Mr Costello said NEA Properties was breaching its own Articles of Association by not having two directors present at the September 2012 board meeting. Mr Parker referred the questions to the County Council's statement about the investigation. He said: "I am not saying anything until the investigation is carried out." Explore Communications was dissolved in July 2016. Northamptonshire County Council has confirmed the authenticity of the emails. The BBC previously reported how NEA Properties Ltd seemingly made spending decisions with little oversight by the council. The company paid for a flyover by a vintage aircraft and spent £80,000 at Northampton Saints rugby club, including the hire of a hospitality box. 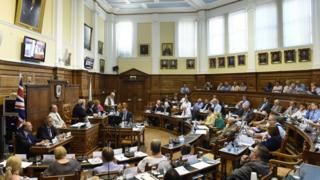 The council has launched an external inquiry into that spending. An independent audit report following a whistleblower referral found no evidence of improper spending or management, but stated "in the absence of various records only limited assurance can be provided". It is unclear if the auditors had been made aware of the £60,000 payment to Explore Communications. An independent external review into NEA Properties has been commissioned by the county council. Which councils are under financial strain? Concerns about finances at Northamptonshire County Council - which has been issued with two Section 114 notices, banning new spending - were made as early as 2013, according to former leader Heather Smith. NEA Properties was incorporated in 1983 under the name Northamptonshire Enterprise Agency to promote the county and managed a number of units at the University of Northampton campus. Conservative councillors Bill Parker and Andre Gonzales De Savage had served as directors since 2010 and 2007 respectively. It sold its properties in September 2014 and £700,000 was transferred back to the council, but £180,000 was spent on other items. Mr Costello told the BBC he made the FOI request in 2014 out of concerns about the lack of openness and transparency within NEA Properties Ltd and other NCC-related companies.